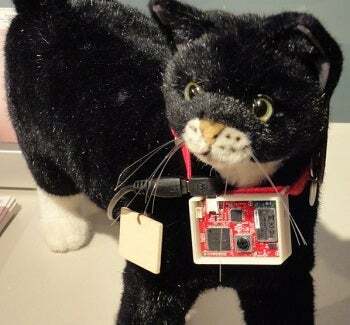 The lifelogging device, can send tweets to Twitter detailing what your cat is up to, packs in an accelerometer, GPS, and a built-in camera. If the acceleration sensor detects movement, for example, the gadget will assume that your cat is on the move. The collar can also detect when your cat is eating or sleeping. The collar has been designed so that it's light enough and small enough that it doesn't cause the cat any discomfort. Once the collar has detected that cat's activities, it will send a tweet about it via Bluetooth. Sony says that the prototype collar can send one of eleven pre-set phrases, however the plan is to add more detailed informative tweets over time. The day-to-day "lifelogging" application of a device like this doesn't seem to have a great deal of merit, much like Mattel's Puppy Tweets toy (or Wired's Beer robot), although the GPS capabilities could be useful if your furry feline friend goes missing. One BoingBoing commenter jested that "There's no indication users would want a Sony tablet, but everyone knows Sylvester wants Tweetie." Would you like to get your paws on a device like this? Let us know in the comments!